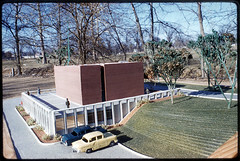 A color slide of Harris Armstrong's model for the Episcopal Epiphany Church proposed to be constructed at Ballas and Dougherty Ferry Roads in Kirkwood, Missouri. The brick masonry cube would house the sanctuary while the lower level would include meeting rooms, classrooms, and other spaces. Funding for the church was very limited, so the only portion built at the time was the sanctuary. The model is shown located on the building site. The photograph was taken around 1959 by Mel Disney, an employee of Armstrong's at the time.